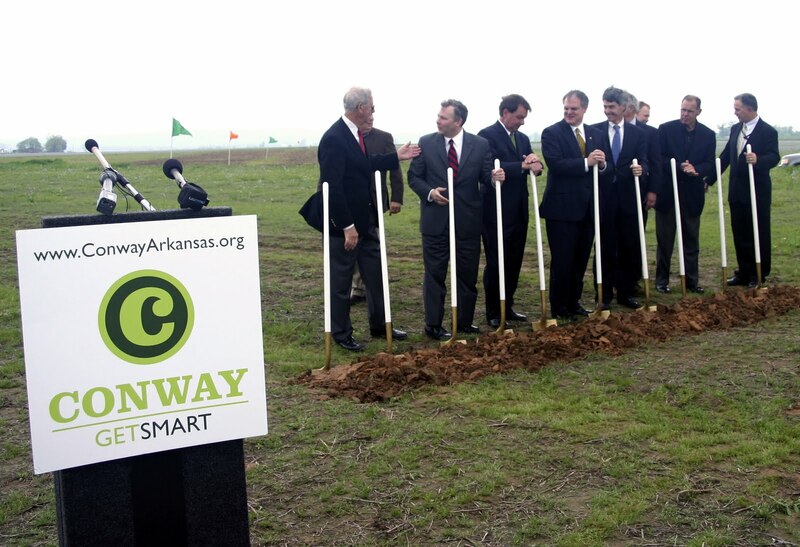 Conway, Arkansas broke ground last Friday on its new $25 million municipal airport. Aided by flags marking the future runway's centerline and two Garver-designed displays, federal and local representatives stood in an open field and imagined how the airport may look in a few years. "The Federal Aviation Administration is extremely pleased to be your partner for this critical investment for your community," said FAA Division Manager Ed Agnew. "Congratulations for reaching this important milestone. We look forward to the day you will open our newest airport in the national system." Conway's current airport, Cantrell Field, is too small to accommodate larger jet traffic, and its short runways have been a safety issue. The new airport will feature a 5,500-foot-long runway, full instrument approaches, full-length parallel taxiway, terminal, fueling facility, and T-hangars. A future phase will expand the runway to its ultimate 7,000-foot length. Conway Mayor Tab Townsell thanked various team members during his speech, including Garver for "all that they are doing for us as our partner in this process." Garver's services include property acquisition, design, bidding, and construction administration and observation. Garver's design includes employing several green features to reduce energy consumption and environmental impact. These include shorter haul distances for earthwork, LED airfield lighting, and landside LEED structural aspects. U.S. Rep. Tim Griffin said that the new airport will provide more than a safer airport. "If you're looking at the future of Arkansas, Conway is a big part of that. 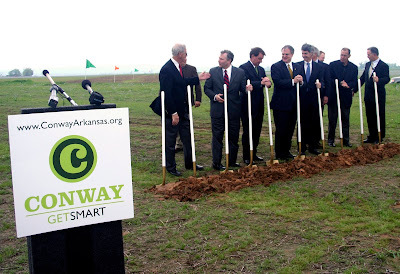 And this new airport will be a big part of making Conway that player, that significant player, in Arkansas' future. At the end of the day, this is going to be an economic engine and a job creator."